Are you thinking about renovating your bathroom soon? Homeowners remodel their bathroom for a variety of reasons. 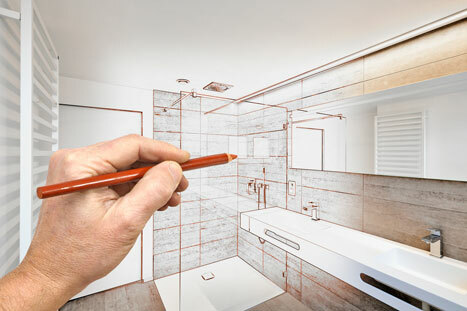 We explore some of those reasons, along with different approaches to remodeling your bathroom. If you are selling your home, improving an outdated or shabby bathroom increases the resale value. Replacing tile, removing wallpaper, or upgrading fixtures and lighting are ways to drastically improve the look of your bathroom. Older, inefficient toilets and showers use more water and drive up water bills. Install updated fixtures, like low flow shower heads, and save money, water, and energy. Address visible damage to the bathroom, such as peeling and cracking, before you need costlier repairs from prolonged water damage and mold development. Older bathrooms may not have proper ventilation either. Adding a bath fan will reduce moisture issues and help with code inspection when you sell your home. Slipping and falling are common accidents in the bathroom, especially for seniors or others with limited mobility. Ease worry and prevent injuries by adding safety-conscious bathroom products like ADA Compliant “comfort height” toilets, slip-free mats, handrails, and an easy-access shower. Hardware – Upgrade your towel bars, toilet paper holders, bath towel rings, and robe hooks for an easy new look. Lighting – Bathroom lighting styles include vanity lights, wall lamps, sconce lights, and ceiling lights. Different types of light evoke emotion, transforming the look of any room. Flooring – Tile, vinyl, or wood? Consider the room’s moisture and humidity levels before you decide, and avoid water damage. Countertop/Vanity – Improve the aesthetic with trendy marble, glass, and tile vanities and countertops. Storage – Options for additional storage include cabinets, shelving, linen towers, and over-toilet shelves. Sink – Update with a vessel, undermount, or wall-mounted sink that works best with the look and space of the room. Toilet – New toilets come in gravity-feed or pressure-assisted options with various custom features and colors. Some high-end toilets are self-cleaning or have water tempering valves to reduce excess sweating on the tank. Shower/Bathtub – Reglaze the vintage claw bathtub, add a shower with a glass door, or install a freestanding tub. The possibilities are endless. Faucets — Choose from many different styles and finishes, including matching faucets, heads, and trim for a clean and stylish look. New Drywall/Paint – Remove old wallpaper or paint over walls. Consider replacing the drywall if there is a mold issue. Leaks – Fix or replace piping and fixture hardware to prevent future leakage. Hanson’s Plumbing & Heating can repair or replace plumbing parts and fixtures for your next remodel. Our experienced plumbers design and upgrade bathroom plumbing for better form and function. Contact us for more details about bathroom renovation.